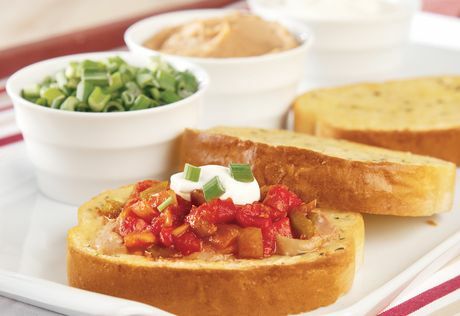 Crisp and cheesy Texas toast is topped with refried beans, sour cream, green onions and chunky salsa to make irresistible appetizers for your next party or buffet. Keep the oven at 425°F. Leave the toasts on the baking sheet. Spread 1 tablespoon beans on each toast. Bake for 2 minutes or until the beans are hot. Top each with 2 tablespoons salsa, 1 teaspoon sour cream and 1/2 teaspoon chopped green onion.